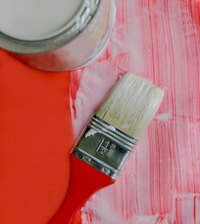 Painting is an inexpensive way to change the look of an item. Unfortunately, painting is also messy and, if not done correctly, can cause your item to look like a train wreck. It is not uncommon for paintbrush strokes to be visible after the paint has dried. It is best to take steps to prevent paintbrush marks because once the paint has dried, removing the brush marks will require some hard work. Put on a dust mask to prevent breathing in the dust created by sanding. Wipe the area you will be sanding clean with a damp cloth. Wipe dry with a towel. Familiarize yourself with the hand-held sander. If you have never used it before, read all instructions and follow all warnings. Secure a 120-grit aluminum oxide sandpaper sheet to the hand-held sander. Begin sanding down the brush strokes with the hand-held sander. Move the sander in a circular motion. Begin at the bottom of item and sand your way toward the top. Rub your hand over the area you just sanded after each pass. Stop sanding when the area feels smooth and the brush strokes are no longer visible. Wipe the dust off the area with a damp cloth. Mix 1 gallon cool water with 1/4 cup trisodium phosphate. Saturate a clean cloth in the mixture and wring out the excess liquid so you have a cloth that is damp, but not dripping wet. Wash the area you just sanded with the saturated cloth until the surface is thoroughly clean. Trisodium phosphate---also known as TSP---is a heavy-duty cleaning agent that is available at home improvement stores. Wear rubber gloves when working with TSP to prevent skin irritation.